Чертёжная доска для творцов. Недовольны тем, как работает стилус в вашем планшете? У Lenovo как раз готов инновационный подарок для творческих умов: пишите или рисуйте на бумаге, а планшет создаст точную электронную копию. Этот тонкий планшет-ноутбук на Windows, может, и не на 100% идеален, но явно способен на большее, чем просто оцифровывать рисунки. В этом обзоре мы рассмотрим новинку буквально под микроскопом. Но если прямо сейчас очень хочется невыносимой легкости бытия с устройством, выглядящим “гостем из будущего”, и при этом неплохо справляющимся с типичными задачами компактного трансформера – готовьте 45 990 рублей (столько стоит Yoga Book с Windows в официальном интернет-магазине Lenovo). В комплекте с компьютером в черном цвете поставляются стилус со сменными стержнями и блокнот формата A5 со специальным магнитным креплением. Android-версия Yoga Book в российской рознице пока не появилась. YogaBook – это очень смелый эксперимент компании Lenovo. Попытка скрестить планшет с нетбуком, а заодно сделать его гаджетом для рисования тут же привекла внимание журналистов и потенциальных пользователей. Но успешной ее назвать нельзя: печатать на компьютере неудобно, для профессиональной работы с графикой он не подходит. С самого начала было понятно, что Lenovo Yoga Book — это особенное устройство. И если оно не подошло под ежедневно выполняемые задачи автора или кого-либо, то это вовсе не значит, что оно не заслуживает права на существование. Однако начнём с недостатков. На стенде Lenovo концентрация чудес была просто невероятной, и видео, которое мы собрали с этого стенда, получилось самым длинным за всю выставку, но оно того стоит! Lenovo has crafted a brilliant, forward-thinking device that could very well create a subcategory in computing all of its own. 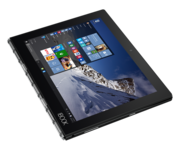 But, with low-power components inside holding it back against the tablet competition, it’s tough to outright recommend you buy the first generation. The tablet is in a weird spot. It was supposed to be this hybrid that lives somewhere between the laptop and the smartphone, complementing both. But as smartphones got bigger and laptops got lighter, smaller and more powerful, it became really hard to justify picking up a tablet. And so, the need for such a device dwindled. 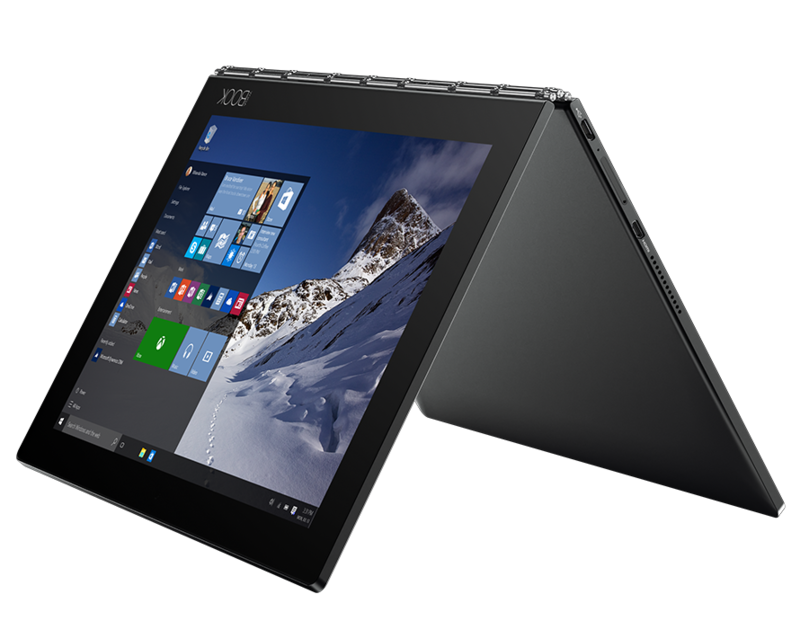 Overall, I hope that Lenovo doesn't abandon this concept and continues to use the Yoga brand to innovate in the often stagnant PC arena, but for most of our readers this device just isn't a great fit. My only note of caution is that, from past experience with this combination of Atom processor and 4GB of RAM, Windows 10 will on occasion seem sluggish. Still, if you’re willing to make speed and keyboard sacrifices for all the benefits that come in return, then the Yoga Book is the device for you. 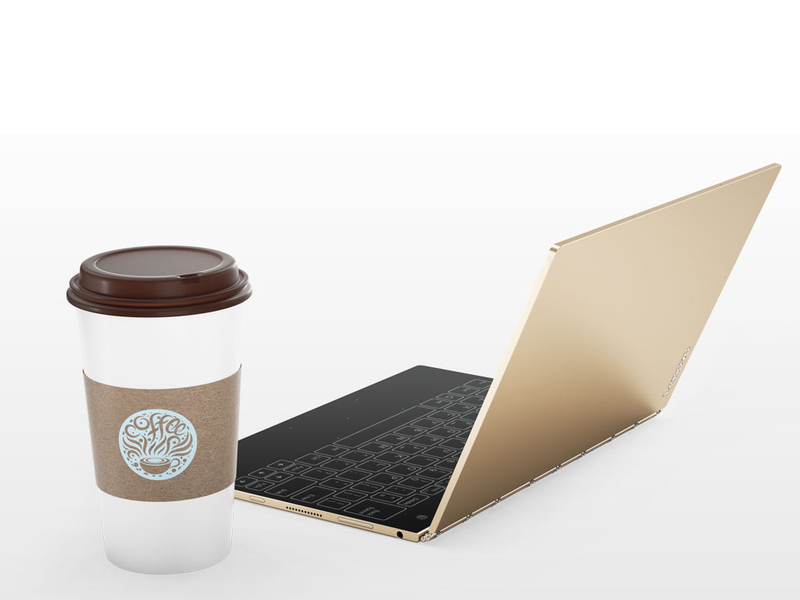 The Yoga Book offers a glimpse of the future in a laptop design. There are lots of reasons to seriously consider the Yoga book; first, it looks cool, it’s a sleek little computer with a Halo Keyboard that looks innovative and also a convertible that can be used as a tablet. Biggest drawbacks are that it’s not a super powerful device and lacks some basic utility ports and some people won’t like the feel of the touchscreen keyboard after prolong usage. The Lenovo Yoga Book is an impressive ambition to reimagine the tablet. The execution is in line too. It’s a premium device with beautiful hardware and long battery life, and is definitely a great companion for meetings and travel. Lenovo's Yoga Book, at this point of time, feels like a laboratory experiment. It's not a failed experiment though. The Yoga Book works well as a tablet and not so well as a laptop. It is slightly better than a regular tablet -- even though its battery life leaves a lot to be desired -- and still far from being an ideal laptop. It is in the middle of it all and Lenovo is well aware of its limitations. At Rs 49,990 the Yoga Book is a lot about the experience, even though it doesn't give you the best of it. If you are patient enough, love to try out innovations and so most of your work in a Web-based world, then this is a no-brainer. Yes, you will get better-specced notebooks for the Rs 49,990 that the Yoga Book charges, but none of them is remotely as versatile, portable or good-looking as it is. We gave the Android Yoga Book four stars and an Editors' Choice. Having tested the Windows version, we've decided that we, um, like the Note Saver app more than OneNote. Android feels peppier on an Atom PC with 4GB of RAM than Windows 10 does, and the Android model didn't seem as slow to recharge. The fantastically light and slim design and top-quality screen are the same, and the flat keyboard equally vexing, on both. If you need a media consumption device, buy a tablet. A cheap Android tablet or an iPad will serve you better. If you need a workhorse, any laptop with a real keyboard is still better. If you need something to sketch on, get a Microsoft Surface Pro 4 or an Apple iPad Pro. Lenovo Yoga Book review: Innovation yes, but is it for you? If you’re looking to buy a plain and simple laptop, Yoga Book is not for you. For the more creative audience, the ones who are skilled artists and don’t mind spending a substantial amount, Yoga Book is a worthy option. The Lenovo Yoga Book is something completely new. It’s edgy and exciting in a way that few other computer products have been for as long as we can remember. It has a surprisingly reasonable price tag, but we’re quite convinced that this will never be anyone’s primary PC, and so it should be seen as an additional indulgence. This could be a great device to travel with, but that’s a waste of the digitser. On the other hand, serious digital artists might want to use software that the Yoga Book is too lightweight to run. There is a middle ground, but it seems pretty narrow. There's no denying the fact that the Lenovo Yoga Book represents an altogether different class of PCs. Features like the Halo keyboard and real-time digitization of notes jotted down using the Real Pen stylus make it a one-of-a-kind gadget. But as futuristic as the Yoga Book is, it's not really usable for today's day-to-day computing tasks. The Lenovo Yoga Book is an interesting concept, but there are kinks to be worked out. The Yoga Book is more like a proof of concept right now, and not the best laptop you can buy for the price. The Yoga Book is a very interesting and unique device. It works as a tablet, a laptop and functions as a pen tablet thanks to the integrated Wacom technology. The nice form factor, slim and lightweight profile encourages you to bring it along instead of your usual laptop. It can handle most of the casual and moderate tasks and with its long battery life, it’s also a good content consumption device. At just 9.6 mm thickness this carbon black 2-in-1 hybrid between a laptop and a tablet really redefines the future of a productivity device for an always on-the-move professional. It weighs just 690 gms and feels like a true hard bound folder when held with both hands. Lenovo’s thinking behind this product has been to create a fusion device between an tablet and a laptop so you get to experience all: browse, work and play. Meant to handle basic productivity tasks, good enough for most professionals on the move, the device packs Intel’s Atom x5 processor within its thin base and works on Windows 10 Pro OS that’s the Windows version for mobile devices. Ultimately, there are certain use cases that the Yoga Book is perfect for. Just don't go and buy it thinking that it could replace your work laptop. 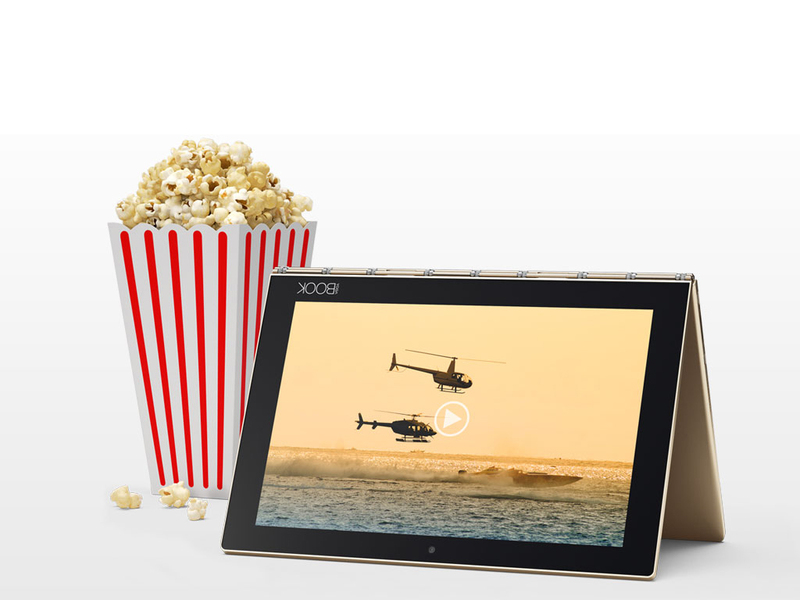 Buy it because you're looking for a tablet that does more than your average device. Lenovo Yoga Book Review: Windows vs Android; Which OS Is For You? Summing up, the Android version has a longer battery life and lower latency, while the Windows version has better Pen technology and a familiarity in PC computing. It seems that the Windows version of the Yoga Book is better than the Android version, but neither of these devices are ideal for daily use primary PCs unless you do more writing and sketching than anything else. If someone asked us for a tablet for an artistic family member, we’d steer them towards the new Yoga Book. Lenovo focused on creating a solid, yet flexible user-input experience at an attainable price, and we think it delivered there. But it’s important not to lose sight of the Yoga Book’s trade-offs too. The Yoga Book is ultimately a light-duty, Atom-based tablet, and most users would probably want some additional horsepower if it was their main computing device. 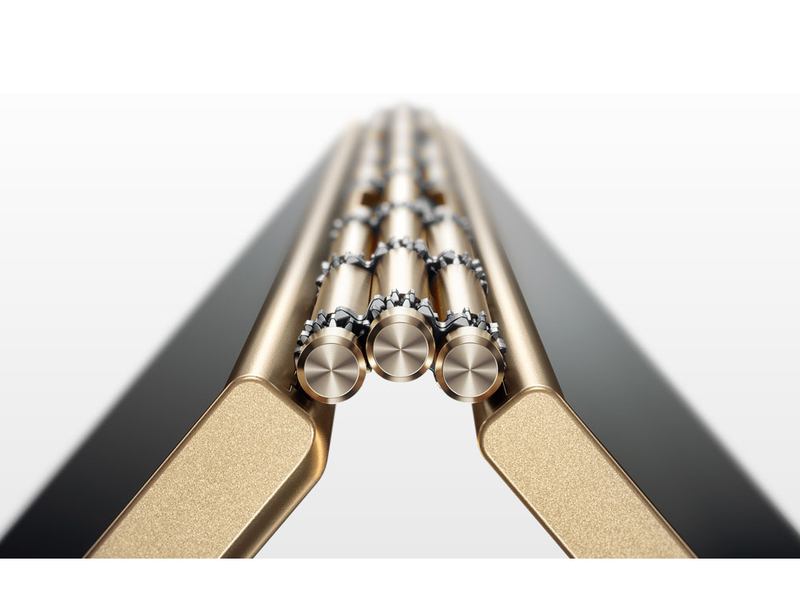 The Yoga Book, however, is well suited to its intended audience that will take advantage of the Real Pen and tablet input, and it offers strong battery life and unique features in an attractive, thin and light form factor. 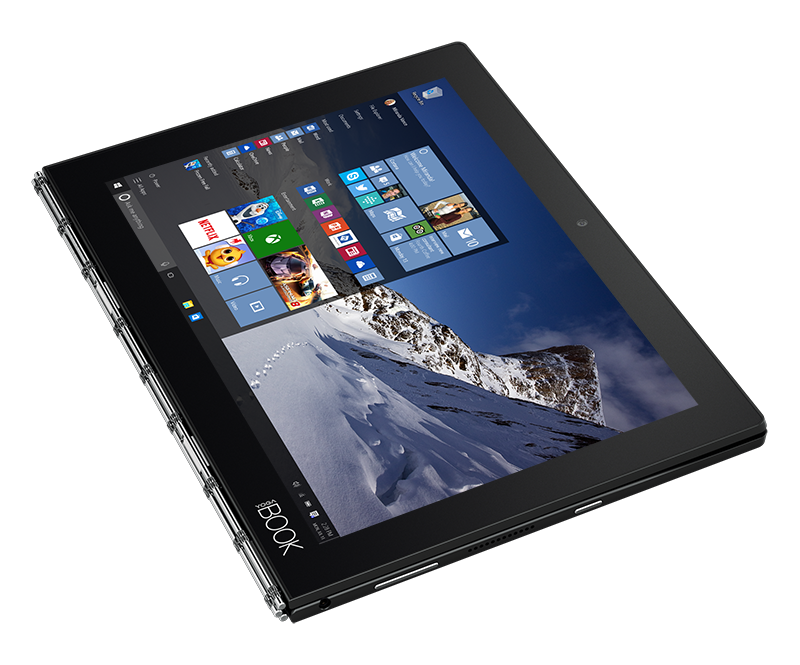 As we mentioned in our review of the Lenovo Yoga Book with Android, the Yoga Book with Windows is priced right at $549.99 and Windows helps this notebook function more like a primary use PC than a secondary device you rarely use. 50% Lenovo Yoga Book Review: Is It Good for Business? 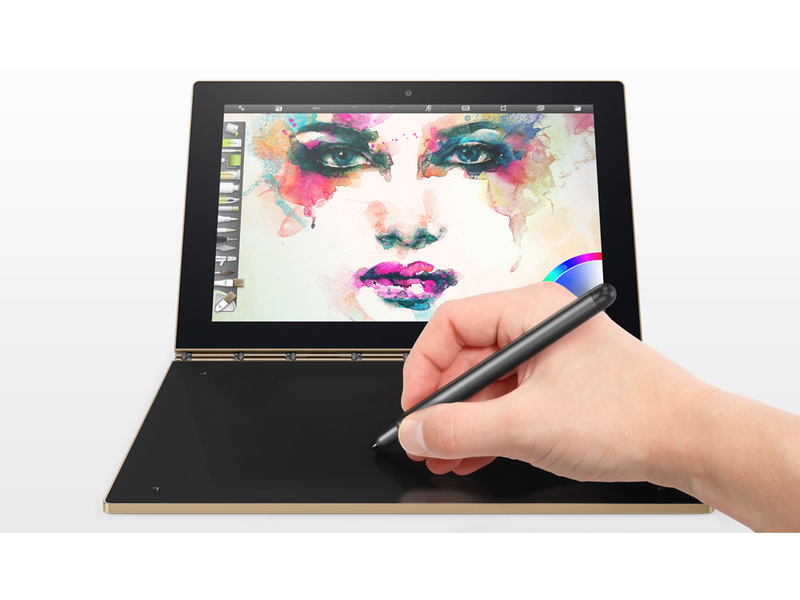 If Lenovo lets you draw directly on the screen in a future version of the Yoga Book, then I might be more inclined to recommend this machine. For now, it's a niche device that most workers won't have much use for. It's rare that a product could be called revolutionary in its thinking, but that's certainly an accolade that could be awarded to the Lenovo Yoga Book. 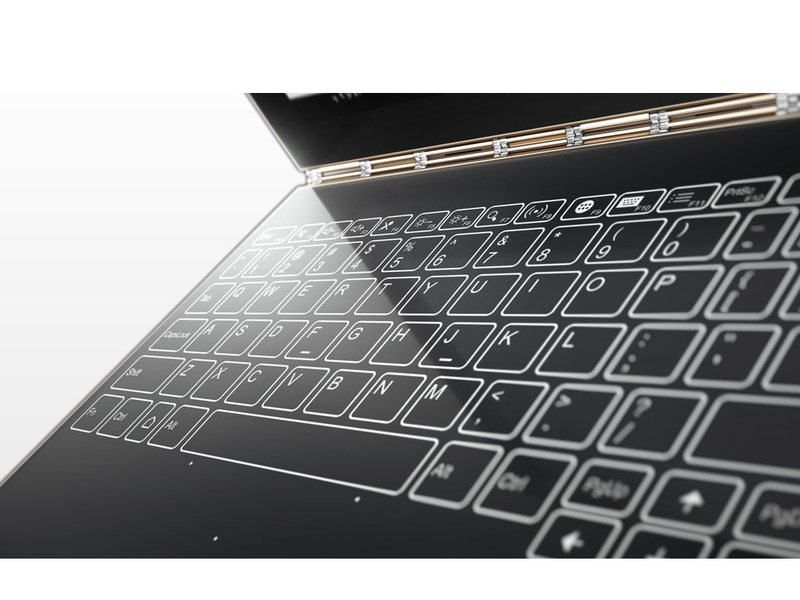 However, while the Yoga Book is one of the most exciting tech products we've seen in some time, it’s also convoluted. Many of its potential benefits won’t be seen as positives by many – even if they do represent an imaginative future – as ditching a traditional keyboard is a bold step into the unknown for many. What the Yoga Book lacks in sheer performance, it makes up for in innovation. It opened my eyes to the possibilities of Windows’ touch capabilities. I see it as a more productive alternative to a tablet, or as a supplementary PC—something easier to take to a meeting than my full laptop. But while productivity can be quantified, creativity cannot be—and it’s the Yoga Book’s encouragement of the latter that points in a very interesting new direction for Windows devices. The Lenovo Yoga Book stirs emotions like few other recent pieces of consumer electronics. Practicality or need be damned--I just want one! I seriously applaud Lenovo for taking a chance on a product like the Yoga Book, and I want them to continue evolving it. It has a lot of promise, but right now I feel that the Windows version is an answer to a problem few of us had--the main advantage of the virtual keyboard beyond good looks is that it allows for a rigid yet insanely thin laptop. Unless you type very little, I'm not sure it's worth the tradeoff. Maybe we'll see laptops of the future with something like Force Touch for the keyboard that will make typing easier and more natural. 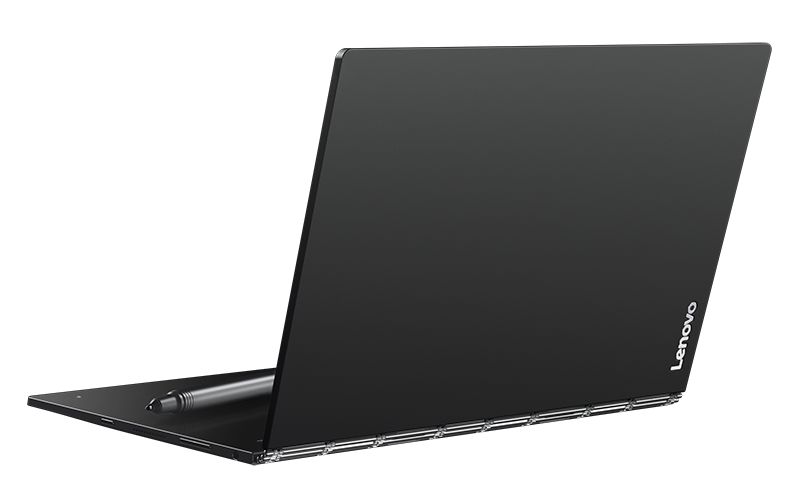 The Yoga Book is the futuristic convertible that I want somewhere down the line. Lenovo definitely gets points for taking a risk and creating such a bold product. The Yoga Book's superthin, superlight chassis is the thing dreams are made of, while the Halo keyboard is straight out of a science fiction novel. The Create Pad gives you a realistic pen feel. 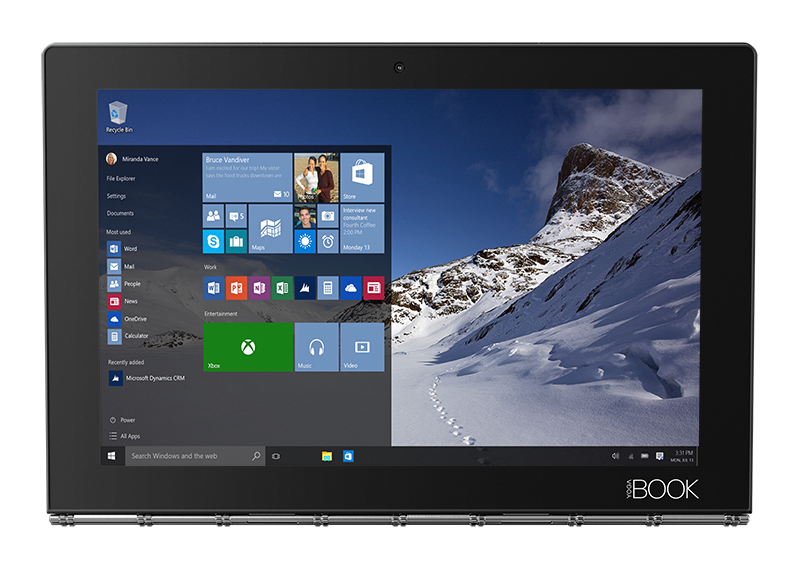 This is a very slim, very light hybrid laptop, available in both Windows 10 and Android versions. The backlit touch keyboard vanishes at the touch of a button and the included stylus works well on both the Wacom surface and with an ink tip on actual paper. The keyboard isn't suited for more than minimal typing, there's only a single Micro-USB port for accessories and charging, and the Atom processor is slower than mainstream laptops. The hefty pen, extra tips and paper pad are a lot of additional gear to carry around. Yes, if you can accept that you are buying an Android tablet with some bonus features, not a laptop. Sadly, we cannot recommend the Yoga Book as a laptop replacement with this processor. It’s an excellent, innovative Android tablet with some cool tricks. However, it’s not the laptop replacement it could be if it had a better processor. For this reason we also do not recommend the Windows version. Wait for the next version, or grab a Windows-based 2-in-1 or Chromebook if you’re looking for more performance and functionality. Inside you’ll find a very basic computer: an Intel Atom x5-Z8850 CPU with 4GB of LPDDR3 memory and 64GB of eMMC storage. I started to benchmark the Yoga Book and just stopped after a few results, because guess what? It can’t play Crysis. It can handle browsing and using a few applications at once, but don’t overload it. The meager memory filled up, especially given the way I accumulate browser tabs. Under heavy use, it also tended to get warm in the upper margin of the bottom panel, near the middle of the hinge. Lenovo Yoga Book: Is It Good for Business? 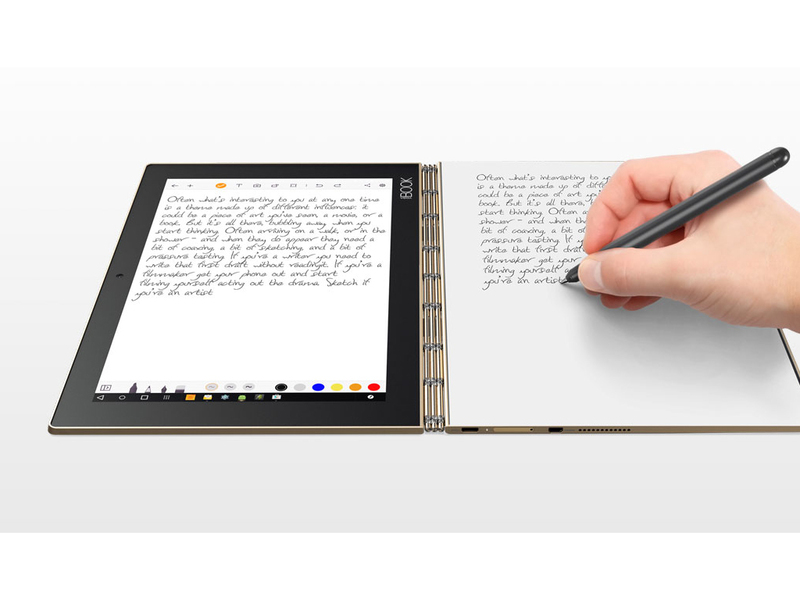 Lenovo's new Yoga Book offers a truly novel take on digital note-taking. The device — which is set to launch in October for $499 — looks a lot like a 10-inch laptop, complete with a folding clamshell design, but it lacks a physical keyboard. 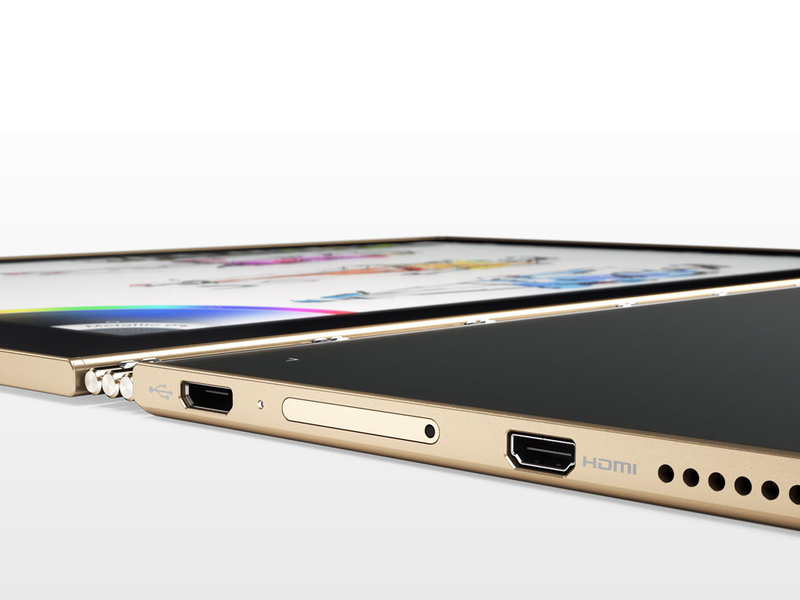 Instead, that space is reserved for a flat, pressure-sensitive digitizer pad, which can be used in two ways. First, there's a touch keyboard that can be toggled on or off — but more on that in a minute. The more interesting functionality is the pad's ability to capture digital notes written down with a real ink pen. There's some work to be done, it appears. While the keyboard works whenever you tap on a text box, the stylus's use is very limited at the moment. You can't use it on the main screen, and you can only use it to draw in apps which support it. The only app on our demo machines was the Note Saver app. It kind of funny that this market screams for innovation and, often, when it gets it gets upset that innovation brings changes. It seems to want innovation but only if there really is no innovation. Having said that, the Yoga Book is arguably one of the most innovative and beautiful tablet products yet to hit the market. The Yoga Book is one of the most exciting tech products we've seen in some time; it's the laptop reinvented. But the learning curve for some - those of us stuck in our old ways - might make it too tricky to use. Not the product for everyone, then, but certainly an innovation. The Yoga Book is one of the most interesting hybrids to arrive this year and could be a breath of fresh air in a stagnating market that seems hell bent on copying Microsoft’s Surface design. I’m super excited to see how the Yoga Book’s touch keyboard and pen work with long term use. On paper the tech has a huge amount of potential for illustrators and those who like to take pen-written notes. This device has a chance of carving a new “ultralight productivity” niche market which is underserved by current products. With current Android/iOS tablets, they become bulky and heavier as soon as you put a keyboard accessory on to get any kind of real productivity. They also don’t offer a paper writing option. The Keyboard integration options are just not compelling enough, or hacky. The Yoga Book has a superb keyboard integration from the start. Lenovo Yoga Book - gdzie kupić? Вот это планшет!!! Вернее, ноутбук... Или дигитайзер? Смотрите: отличный планшет с возможностью ввода пером. И клавиатурой! А ещё можно положить на него лист бумаги и писать (или рисовать) ручкой, и он всё оцифрует. При этом лёгкий и работает 10 часов. Звучит интересно? Ещё бы! подробности - в этом обзоре YB1-X90F. Стоимость Lenovo Yoga Book сравнима с менее функциональными аналогами и даже с планшетами. Приятно, что компания разрабатывает новые форм-факторы и предлагает пользователям технологии будущего уже сегодня. Lenovo Yoga Book YB1-X91F выполнен из алюминиево-магниевого сплава, поэтому он легкий и прочный. Трансформер может функционировать в одном из четырех режимов: ноутбук, планшет, консоль и презентация. Качественный Full HD-экран – безусловно, также плюс лэптопа. 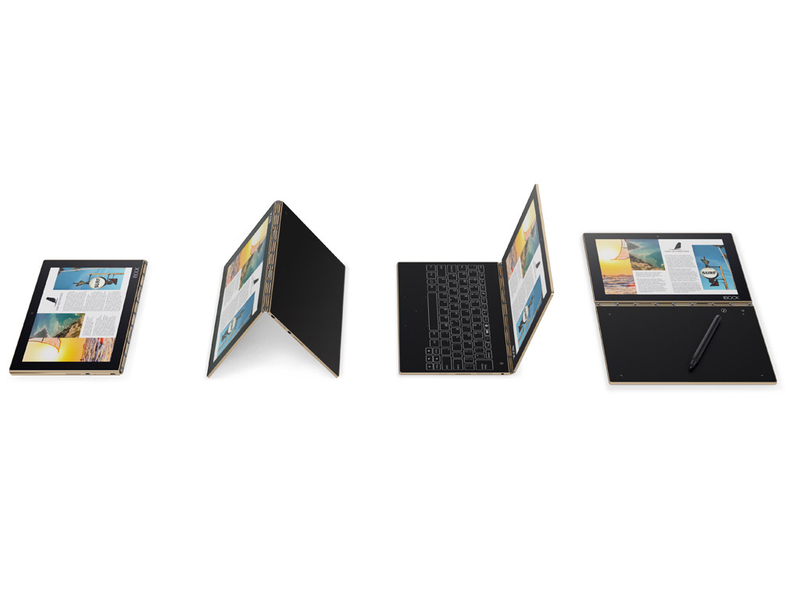 The Lenovo Yoga Book is a bold move. It does point to a convertible concept of the future. The hinge and paper writing digitization trump the current competition, and a bigger Yoga Book might be even more attractive. With a 12″ screen there’s room for a correctly spaced keyboard and a bigger touchpad. В новом Yoga Book вместо клавиатуры установлен сенсорный E-Ink дисплей, а значит, новинка может превращаться не только из ноутбука в планшет, но еще и в электронную читалку! Но мало того, вы также можете переводить в электронную форму любой написанный текст и оцифровывать рисунки с бумаги. Внешне ноутбук очень напоминает своего предшественника из 2016 года, но содержит как изменения, так и улучшения знакомого нам концепта. Он более производительный, но одной интересной возможности у него теперь нет. Итак, стоит ли Yoga Book 2018 года установленной цены и действительно ли он лучше предыдущей версии, мы выясним в обзоре. Ноутбук Yoga Book C930 — своеобразный девайс. С одной стороны, весьма инновационно и оригинально. С другой стороны, пользование такой клавиатурой — удовольствие сомнительное, потому что требует навыка. И если в смартфонах сенсоры заменили таки QWERTY-клавиатуры, то в этой модели все сложнее. Intel HD Graphics 400 (Braswell): Intel HD Graphics 615: Графический процессор с 24 ядрами, встроенный в некоторые центральные процессоры поколения Intel Kaby Lake. 7Y54: Энергоэффективный процессор семейства Kaby Lake. Два ядра могут работать на частоте от 1.2 до 3.2 ГГц, поддерживает Hyper Threading. производится по 14-нм техпроцессу. 75.25%: No rating comment found (one expected)!Общие рекомендации по выбору электроники: Гид покупателя.